The Houses of Parliament, Buckingham Palace and Piccadilly Circus were among London landmarks plunged into darkness to raise awareness of global warming. Lights across the city were switched off for an hour on Thursday night to encourage London's three million households to conserve energy. 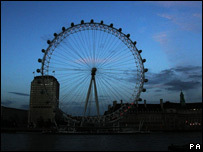 The Lights Out London campaign aimed to have all non-essential lighting turned off between 2100 and 2200 BST. It followed similar campaigns in cities including Sydney, Paris and Rome. It was the first time the lights at Piccadilly Circus had voluntarily been switched off since World War II. 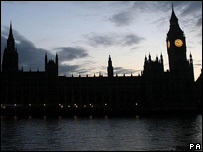 Earlier on Thursday, environment minister Ben Bradshaw urged all Londoners to switch off their lights during the blackout. Speaking in the Commons Mr Bradshaw said: "Excessive illumination contributes to climate change and you may like to join in, if you are in London tonight, the London Lights Out campaign." Organisers said if Londoners were to have switched off their lights, the city would save 380 tonnes of CO2 in just one hour, enough to fill more than 2,000 double-decker buses or the Royal Albert Hall twice. The event was based on Earth Hour, a similar, hour-long mass switch-off earlier this year in Sydney that involved 65,000 households and 2,000 businesses and landmarks, including the Opera House and Sydney Harbour Bridge. All six advertisers at Piccadilly Circus agreed to switch off, the first time since 1939 when they went out for the blackouts at the start of World War II. They were switched back on in 1949. They have been forced to switch the lights off due to power cuts and the imposed three-day week in the 70s, the Museum of London said. Lights Out London, organised by the radio station Capital 95.8FM, was supported by Friends of the Earth. Jenny Bates, from the environmental group, said: "The majority of the capital's carbon dioxide emissions come from buildings, so switching off lights and appliances that aren't needed can play a significant role in tackling climate change. "And it can save you money too."